When you are missing multiple teeth, common replacement options such as removable dentures, numerous implants on an arch, or a fixed bridge may not be the best solutions. They can be extremely costly, reduce your ability to chew, are aesthetically unpleasing, and usually require numerous appointments, extended healing periods, and occasionally even additional procedures such as bone grafting or sinus lifts. At Geelong Oral and Maxillofacial Surgery, our skilled surgical team can place four specialized implants into your upper and/or lower jaw, providing adequate support for an entire arch of beautiful teeth. This procedure, called the All-on-4® Treatment Concept, allows you to experience the aesthetic and functional benefits of your new teeth more quickly than most other restorative procedures because it can be completed in two surgical visits with reduced healing time. Prosthesis Stability: While no procedure can restore teeth to the exact strength of your original teeth, the All-on-4® Treatment Concept anchors your implants into better quality anterior bone by tilting the posterior implants and increasing the ratio of implant-to-bone contact. This provides extra support for your replacement teeth. Prosthesis Flexibility: Your replacement teeth will be screwed onto your new implants immediately after your surgery. Unlike other implant procedures that delay the placement of the replacement tooth or teeth, you can begin experiencing the functional and aesthetic benefits of your new teeth right away. Increased Procedural Efficiency: Your implants and replacement teeth can be placed in just one surgical procedure. With only four implants placed, this treatment minimizes recovery time and mitigates post-surgical side effects such as pain and swelling. Excellent Clinical Results: The unique placement of your implants reduces the negative side effects of other treatment options, such as relying on existing teeth to support the weight of a denture. At Geelong OMS, we employ minimally invasive surgical techniques when placing the implants to ensure that patients experience a successful recovery. How Do I Know if I Am a Candidate for the All-on-4® Treatment Concept? If you are about to lose the majority of your teeth or are currently wearing dentures, you are a great candidate for this procedure. 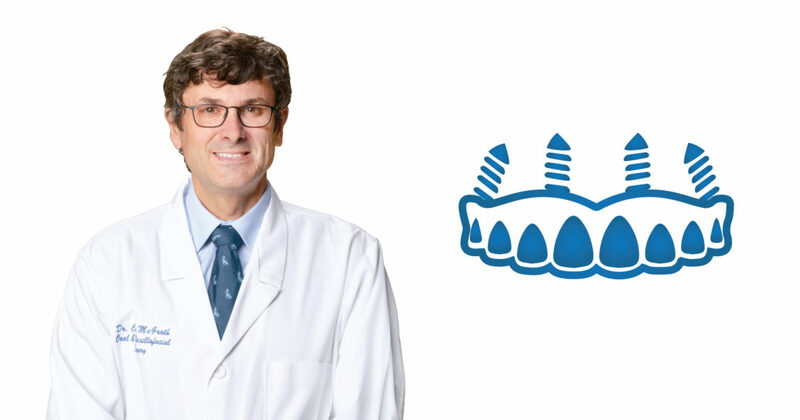 Many patients who were told that they are not a candidate for a fixed bridge or an implant due to bone loss are candidates for the All-on-4® Treatment Concept. If you think this procedure is right for you, we invite you to schedule a consultation at our office. Our skilled surgical team will complete a full oral and medical evaluation to determine the most appropriate plan of treatment to address your individual dental needs.